Due to the rapidly changing world in which we live, customer expectations continue to shift dramatically in the 21st century. In many instances, trends in customer service expectations are being driven by the pervasiveness of technology, especially social media. 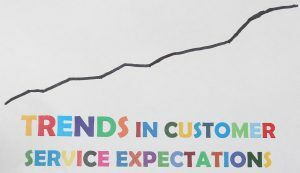 The following are some of the customer service trends that I have identified by talking to workshop attendees, customers, friends, and conducting a survey of available research and publications. These trends have a powerful impact on customer expectations. 24/7/365 mentality. Today’s customers expect that they can get what they want, how they want it and when they want if twenty-four hours a day, seven days a week and three hundred and sixty-five days a year. When service and product providers are not available or cannot meet this expectation, customers simply go to a competitor who can. Efficiency in service. With the advances of technology, customers do not expect to have to repeat steps or be inconvenienced when receiving service. For example, some organizations require that credit card and personal information be entered on a computer screen or through an automated phone system when ordering or calling with questions or problems. When the customer is then connected to an agent, they are often asked to repeat their information. Prompt response. Another one of the trends in customer service crucial in satisfying today’s customers is prompt service. The days of accepting “Someone will get back to you within twenty-four hours” are over. Customers see progressive companies using multichannel service response systems (e.g. online FAQ, customer care center 24/7/365, access through mobile technology, automated voice response systems, email, and chats) to ensure availability and response to customer needs, wants and expectations. They expect all companies to follow a similar model. Human interaction. Automated response might be acceptable in some situations if it provides the information or satisfies customer needs. However, efficient human contact is typically the preferred means of response for most customers. The key is that the humans involved need to be well-trained, competent and knowledgeable, not scripted. They also need to be fluent in the native language of the majority of company’s customers. Service effectiveness over fluff. Incentive programs are nice, but what typically keeps customers coming back is that timely, effective and friendly customer service. This helps organizational efficiency and enhances customer loyalty. Meeting the needs wants and expectations of a diverse customer base will often win out over a free refill, discount off a next purchase, or a “buy 10; get one free” loyalty program offer. Low tolerance for errors. In a world where companies like FedEx promised “When it Absolutely, Positively has to be there overnight,” computers have spellcheck to help catch errors, and many companies have unconditional guarantees to make it right when something goes wrong, customers are not as likely to accept excuses. They expect companies to live up to their promises and what they put on their websites. They also expect that all employees are empowered to make decisions and fix problems without having to get their supervisor. Free shipping. For years, leading companies like Zappos, Amazon, L.L. Bean, Lands End have been offering free shipping, and in some cases free return shipping. This can result in big savings if someone regularly orders from a company or places large orders. There are many other customer service trends of which you and your organization should be aware in order to meet the needs, wants and expectations of your customers. Take time to search the Internet for additional articles, read books on customer service trends, and attend customer service conference and training sessions on the topic. Do whatever it takes to better prepare to meet changing customer expectations and help ensure customer satisfaction. What customer service trends have you identified in dealing with your own customers or talking to others? Share them with other readers. This entry was posted in customer expectations, customer service trends and tagged 7 trends in customer trends for 2016, trends in customer expectations, trends in customer service. Bookmark the permalink.